Is it getting difficult to read fine print or to see in low light? Have you begun moving your phone further away to find the “sweet spot” where you can see clearly? Then you might have presbyopia. But it’s completely normal. Once you hit your 40s, everybody gets it. These lenses are manufactured with LACREON technology. This moisturising substance helps the lens retain moisture from morning to late evening. 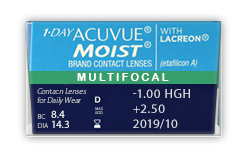 Made from breathable etafilcon A, with a unique, eye inspired back-curve design, Acuvue Moist Multifocal lenses are among the most advanced contact lenses available for presbyopia patients. The breathable allows more oxygen than ever to reach your eye, while the curved shape keeps the lens in place, ensuring your vision is always crisp and accurate. 1-Day Acuvue Moist Multifocal has a high UV protection and they are perfect for people with an active lifestyle. Be the first to write an online review of 1 Day Acuvue Moist Multifocal and share your thoughts on this product with other shoppers!